The most innovative minds in science and technology reveal a vision for the future of life on Earth – and beyond. Every year, 200 experts across machine learning, automation, robotics, and space arrive in Palm Springs for MARS – the yearly, invitation-only event hosted by Amazon founder and CEO Jeff Bezos – to share new ideas about how these four fields will shape our future. 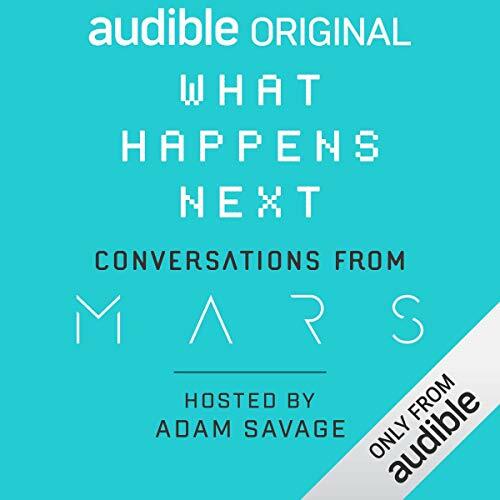 In What Happens Next: Conversations from MARS, TV host and maker of things Adam Savage (MythBusters) takes listeners deep inside the MARS conference. In interviews with more than a dozen leading scientists and thinkers – including former astronaut Mike Massimino, iRobot co-founder Rodney Brooks, Dava Newman (former deputy administrator of NASA), Oren Etzioni (CEO, Allen Institute for Artificial Intelligence), futurist Kate Compton, and Caleb Harper (director of the Open Agriculture initiative at MIT) – Savage explores the mind-blowing and often misunderstood ways in which science and innovation are transforming the way we live, work, and play. Full of wonder, optimism, and plain old awesomeness, What Happens Next will be a revelation for anyone who’s ever wondered about what our future will look like and how we’ll get there.